I was tagged by Valerie from Little Dutch Bookshop, the creater of this tag which is really exciting for me because I have never actually been tagged before. Although to start with I wasn’t that excited by the start of the Olympics, being able to watching it online while at school with my friends has really helped me to get into it. I especially enjoy the Equestrian and Gymnastics but have watched Hockey, Basketball, Volleyball and Diving. Basically whatever’s no at the time. I am going to follow in Valerie’s footsteps and use this as an opportunity to show case some amazing athletes. Let’s get into it. Artistic gymnastics is all about grace and beauty, especially on beam and floor, but if you only flex your toes for just a second on any other event, such as bars or vault, it can lead to a deduction that can cost you your golden medal. That’s why I want to know: What is a beautifully written book? I love gymnastics. It is just so great to watch, almost super human. I go to a fitness and gymnastics class every week but I still can’t imagine doing all the amazing things that the Olympic gymnists do. It scares me how high they jump and how fast they run. The gifs above are of Larrissa Miller, the only Australian artistic gymnastic representative. The book I am choosing for this is The Final Empire by Brandon Sanderson (my review here). I read this book earlier this year and to start with I didn’t enjoy it but the more I read it… wow things came together amazingly. The world building was seamlessly incorperated into the writing and the character building was so effortless. I want to read this book again so I can fully appreaciate how amazing it is, and I probably will once I have the whole series. Athletics is all about speed. In most events the fastest person wins, but in other events your speed is also an important part of your chance yo win that gold medal. So you can really say that speed is key. That is why I want to know: What is a fast paced book? Athletics has never been something I’ve watched much of, however it is actually really good to watch because it doesn’t take that long compared to watching a whole hockey game *cough cough Australia vs British hockey game that took until the last quarter for anyone to score* *cough also Australia vs Argentina for the same reason*. 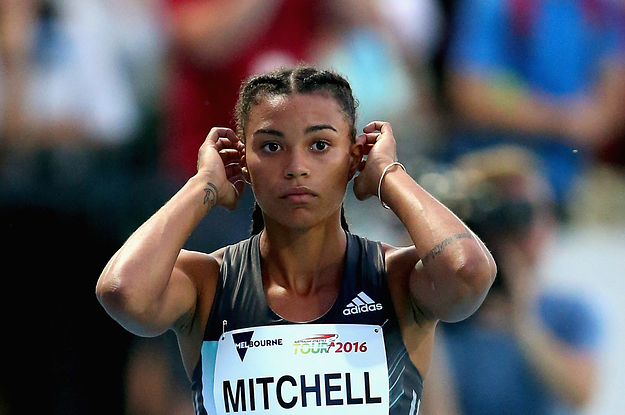 They haven’t had much athletics on yet but above is Morgan Mitchell, a 21 year old Australian 400m sprinter that I am looking forward to watching. My book for this one is The 5th Wave by Rick Yancy. I found this book got to the point quickly and had a lot of engaging scenes. Most of the story was inside the character’s head, of them describing things that were happening to them. This could easily become boring, but it didn’t. Conflict continued to happen which kept the book fresh and the build up to events readers knew were going to happen kept me engaged right to the end. I really enjoyed this book and read it in a couple of days. Beach Volleyball reminds me so much of summer! I mean, you can only play it on the beach, it is fun to do with friends. It makes you forgive all of the sand for getting into places you don’t actually want sand. That’s why I want to know: What is a perfect book for summer? I haven’t watched any beach volleyball yet, but even looking at these pictures makes me feel more summery and considering it is the middle of winter here in Australia I need a bit of brightening up. Above is Taliqua Clancy, an Australian beach volleyball player who won her three preliminary games. I wish her all the best for her future games. Trying to find a book to fit this topic made me aware of how few light contemporary type novels I actually read. I am going to pick Talon by Julie Kagawa. This novel has a Romeo and Juliet type romance and takes place in California. The main themes are of self discovery and being true to yourself which I relate to summer. I can imagine reading this book outside in the sun and it is a cute story that makes me feel happy inside. Divers is all about getting into that water without making a splash, but it is also about strength and, when performed by two divers, about synchronity. But all in all the fact that they dive that far into the water, knowing that when they mess up, it hurts is very respectable. That’s why I want to know: What is a book you read without knowing anything about it bedore you started. The diving is really fast but amazing to watch. Above are James Connor and Domonic Bedggood, Australian divers. Their expressions mid-dive are quite entertaining but the feats they accomplish are truly amazing. I don’t read many books without knowing a little bit about them whether it be a friend or booktuber’s opinion or the blub. One series that I did know very little about going into was The Demon King by Cinda Williams Chima. This novel was lent to me by a friend who said it was amazing, and the blurb on the edition I had was very short. This novel didn’t disapoint and before long I found myself sucked into this quartlet. It is a fantasy adventure series that is expertly crafted to keep you engaged at every turn. I would highly recommend it. I have been an avid watcher of the equestrian. I enjoyed watching the cross country and a bit of show jumping. It is just amazing to watch the power and speed of the horses. 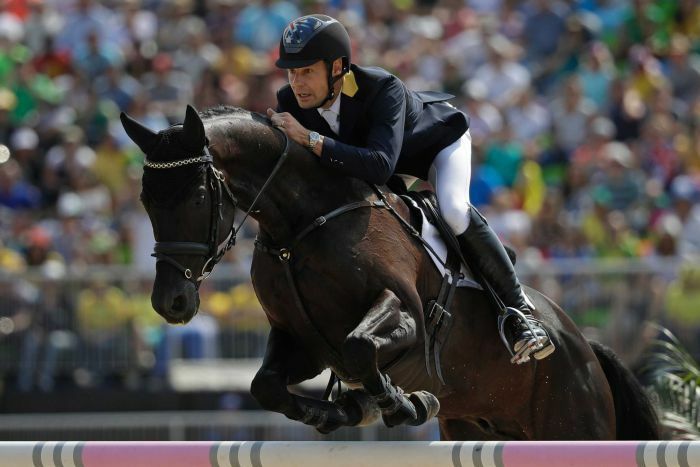 Above is Christopher Dalton, an Australian equestrian competitor and his horse Santano II. I think that if I was to compete in the Olympics I would want to do equestrian, not that I’m good enough to actually get there… just as a I wish sort of thing. I am choosing Ignatius from The Novice by Taran Matharu (my review here). He was a constant companion in the novel and provided a sense that the main character wasn’t alone. Ignatius was unique and there were several scenes where he was very useful and important to the plot of the novel. He seemed to have a personality of his own despite not speaking a word which was really great. I actually don’t read many novels with talking animal companions… maybe I should. Rhytmic Gymnastics is all about flexibility. Gymnasts perform all kinds of contortionistic moves, and that all while keeping their eye on a prop. And they are also able to include this prop in their, often graceful routines. It hurts my back looking at it, but I want to know: Who do you find a very flexible writer? I am so pumped to watch the Rhytmic Gymnastics, above is Danielle Prince. As I’m sure you’ve guessed she is the Australian representative. Her costumes are so intricate and eye catching, and she is so graceful while doing her routines. My choice for this one is Maria V Snyder. I have read nearly all of her books and I aspire to write like she does. Her work includes a unique fantasy world which is the setting of a few series meaning there is so much world building. The magic system is amazing and her characters are clearly very different and think in different ways. However she also has a sci-fi series set on a space ship with a dystopian style class system which was also amazingly written. And then she has another fantasy world that I haven’t read any books set in but I have high expectations for. Her tactical writing for battles is amazing and she can also write really good scenes about a character’s inner emotions. Thanks so much for tagging me once more Valerie, this tag has allowed me to find out more about some amazing athletes and recommend a few books that hopefully you find interesting. **Note** As much as I wanted to add gifs for most of these I struggled to find any so resorted to photos which still manage to convey the amazing feats of these athletes. Finding gifs of athletes is really hard I struggled with it so much! While I have yet to read any of the books you mentioned some are on my TBR because I heard so much good things about them! Thanks for doing my tag! Loved your answers! Fairly sure he’ll have a great read. Thank you for sharing!